Do You Need A Devil? Most any movement in the history of civilization began with the intention of opposing some kind of evil. The abolitionist movement opposed the injustice of slavery. Communism opposed capitalism, greed, and inequality. The civil rights movement opposed the inequity of American culture toward African-Americans. The environmental movement opposes environmental irresponsibility. The Moral Majority opposed the moral decay of America. The Tea Party opposes big government. None of these movements could exist by simply opposing an idea. They must attach a face to the idea. They must have a devil. The devil for Communists was America. The devil for environmentalists is big business. 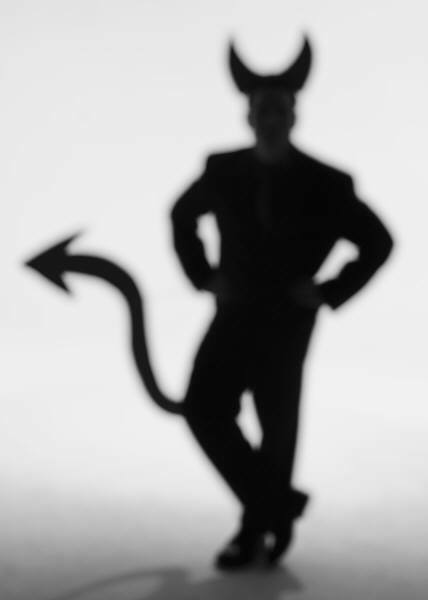 The devil for the Moral Majority was media companies and liberal politicians. Every movement needs a devil. We do make other human beings into our devil, though. We do it all the time. It makes us feel better about ourselves. It makes us feel like we are on the right path and we are doing God’s work when we demonize atheists, abortionists, liberals, rich people, homeless people, Hollywood, Muslims, politicians, oil companies, teenagers, people who use drugs, people who have tattoos, people who wear short skirts, scientists, Catholics, fat people, poor people, the president, the media, environmentalists, educators, Republicans, universalists, people who buy lottery tickets, musicians, artists, socialists, bikers, Jews, fundamentalists . . . When we make people outside our group into the enemy, we are guilty of “fighting against flesh-and-blood enemies.” We create God in our image and the devil in the image of everyone else. I do believe that we all must have something to fight for. The problem occurs when we choose an enemy to fight against rather than a cause (or person) to fight for. Soon, we are defined by our enemy rather than our cause. In what ways are you or your group defined by your enemy? When you talk among your group, does you conversation revolve around what (or who) you are opposed to, or what you want to accomplish? How can you shift focus from your devil to your mission? Why Do You Like Bad Things To Happen?